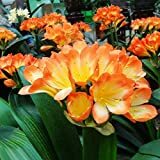 Clivia growing herbaceous geophyte of the genus Clivia also known as Natal lily or Bush lily, Clivia perennial evergreen plant, used as ornamental plant and as cut flower, can grow in tropic, mediterranean, subtropical climate or as houseplant and growing in hardiness zone 10b+. 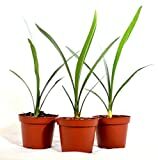 Leaves color green in narrow linear shape grow in rosette structure. 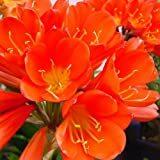 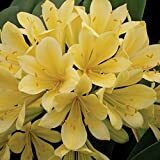 Flower fragrant color can be: red, orange or yellow in trumpet shape, flowers grow on stem connect in clusters.